Ep 247- Context. How Many Of Us Use It? One of the most damaging communication techniques in a relationship is using assumptions. Assuming what people know. What they think. What they will or won't do. When you don't help people understand or help them fill in the blanks, people will come to their own conclusions. Those conclusions tend not to be too positive either. 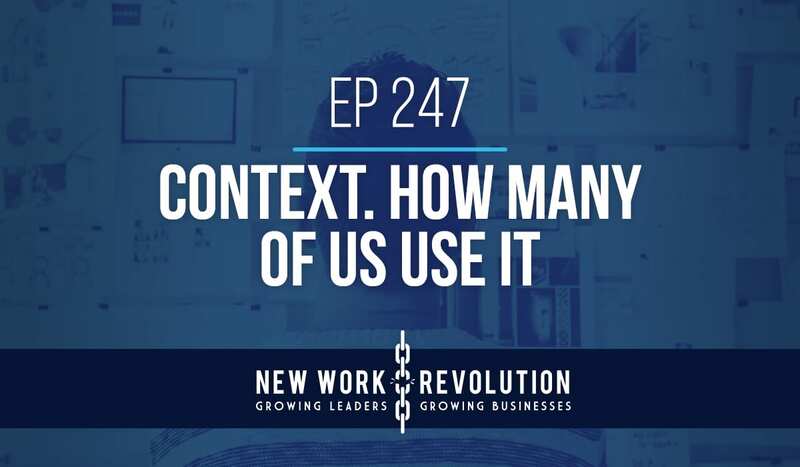 Context can be a powerful tool for giving a well rounded set of information about the organization and the leadership of the organization. The question is, are you using it. In the Total Experience Design methodology, we talk about leadership being a key component to creating a high level experience. Experience starts inside the organization. Communication is the tool that leaders use to organize, inspire and move the people in the organization. If you miss setting context, you are missing your ability to communicate powerfully. Click the player above to listen to this week's podcast. If you haven't subscribed and rated the show in iTunes, go do it now.